Newborn session with siblings in Portland! If you have kids, how old were they when you could actually take some decent pictures you can put on your wall? As kids are so active, they don’t not stop for your shutter chance. If you force them, they will give you the fake smile… Some kids are really good at making a smile for adults. 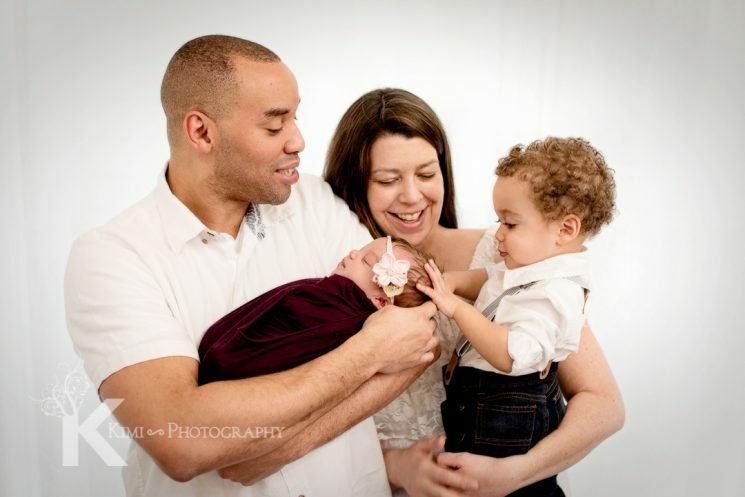 This beautiful family came over to Kimi Photography to have a newborn session with siblings in Portland. An under 2-year-old boy usually would not stop moving! This boy was really fun and cute, and he behaved perfectly at their newborn session! To capture newborns with brothers and sisters, first I let the newborns pose, then place older siblings. She has so many facial expressions! I almost always add some artistic composed images to a collection in my newborn session. Details are always great to remember how small they are! If you have a child already and are having a newborn too, and you don’t think you can get any pictures of them with all chaos you are dealing with everyday, please contact us! Kimi Photography provides newborn session with siblings in Portland. Kimi Photography is a featured photographer! 2014 © Kimi Photography. Portland Wedding, Portrait and Newborn Photography Kimi Photography.